The second and third year MBBS students of SRM medical college enrolled themselves for the 'Swachh Bharat Summer Internship Programme-100 hours of swachhata', launched by the Government of India. The students adopted the village of Anjur under Kattankulathur block of Kanchipuram district and conducted many activities towards the cause of rural sanitation in India for a duration of 100 hours. The various activities like Field visit and surveying about solid waste management, Waste Collection Drive, Street clean-up, Sapling Plantation, Door to Door Awareness campaign on open air defecation, Talk on menstrual hygiene and steps of hand washing, Development of compost pit, Conducting activities in Govt. 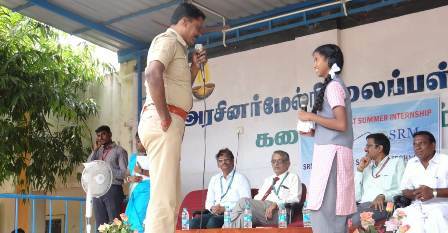 High school, Wall Paintings on the theme of Cleanliness and Sanitation were performed by the students with great zeal. 'THAT BAND' at Phoenix Marketcity!